Building outdoor projects that will stand up to the weather requires that you choose species of material that will withstand the temperature extremes and moisture that Mother Nature can throw at your project. There are specific wood species that are better suited for outdoor projects than others, but some of them can be quite pricey and even controversial in its use. Teak is a good example. Even though there are two varieties that are commonly sold as teak, because one of them, in this case, tectona, was historically harvested using clear-cutting methods in Southeast Asia, it has become politically incorrect in some circles to use teak for woodworking projects. The bald cypress tree is the state tree of Louisiana and is very well-adapted for use in outdoor woodworking projects because of its resistance to water. Bald cypress trees typically grow in swampy areas or along the edges of rivers and can grow to be as much as 100 feet tall with trunks of five to six feet in diameter. Many downed bald cypress trees have been dredged from the bottoms of lakes and rivers and are just as usable as newly-felled bald cypress trees. Due to this inherent weather resistance, bald cypress has been a common choice for boat builders for centuries, but it doesn't have to be used just for outdoor projects. Many woodworkers have used cypress for furniture projects and more. While bald cypress may look like and be used like a hardwood, technically it is a softwood. Once harvested, the wood has a light color that can also appear as a light brown or reddish tint. 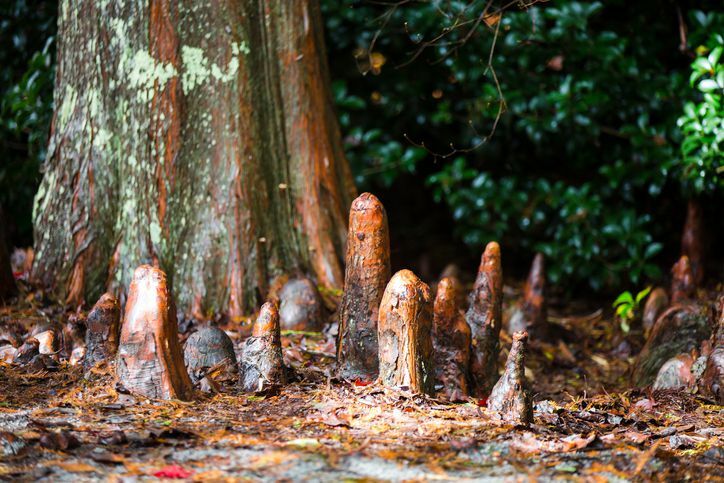 On occasion, fungi can attack the tree and leave behind pockets of darker color, which is called pecky cypress. The grain of the wood is relatively straight, which is part of the reason for the stability of the wood, making it desirable for furniture applications. Woodworking with bald cypress can be similar to working with oak, requiring patience and sharp tools. When surface planing or routing bald cypress, taking too deep of a cut can cause gouging tear outs. You'll see far better results making multiple, very shallow passes through the planer or router. Keep in mind that your knives, blades, and bits may dull a bit faster cutting bald cypress than other, more common varieties of wood stock, but by utilizing patience and keeping the cutter moving to avoid burning, you should see some great results. The heartwood of bald cypress tends to be darker in color than the surrounding sapwood, with a somewhat unpleasant odor given off when working with the wood. It sands well, but the wood can have an almost greasy feeling, which tends to gum up sanding disks. Using new sandpaper and progressing through various grits, from coarse all the way through to very fine grits can produce a very smooth result. Assembling projects using bald cypress should be similar to other hardwoods, in that the stock tends to hold mechanical fasteners and glued edges with ease. Bald cypress can be finished in a variety of ways. While it is ideally suited for outdoor uses, it doesn't necessarily look all that great as a stained finish. However, it does take paint well, which can add to the durability of the wood in outdoor applications. Polyurethane topcoats, as well as lacquer finishes, may be used should you decide to stain rather than paint your project. The unusual odor of the wood that is present when cutting or sanding tends to fade considerably after finishing.